Derived from the Latin word meaning bad smelling, this black, resin-like mass is often called “devil’s dung” and equated to the strong, pungent order of truffles. 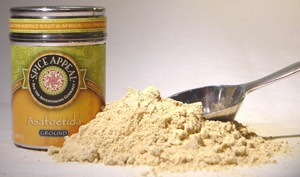 However, when used at very light or “pinch” levels, asafoetida’s unpleasant smell remarkably disappears. It is used often in Iranian and South Indian vegetarian dishes to enhance flavor. Add sparingly to fish curries, brined or pickled fish, grilled or roasted meat, grains and legume dishes.